The Santa Cruz Lounge Series Settee has buffalo split polyurethane coated leather on all seated surfaces. It has a seat that is 19"H.
The Napoli Series Suite #9 consists of a 72"W Desk, a Curved Desk Ext. (right), a Curved Desk Return w/Pencil-Box-File (left), a Center Drawer, a Low Wall Cabinet, and two 2 Shelf 1/4-Round Bookcases. 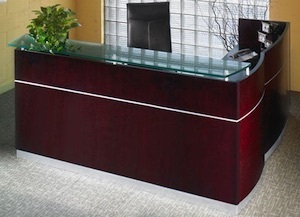 The Napoli Series Suite #32 consist of a 72"W Desk, a Curved Desk Ext. (right), a Center Drawer, a Bridge Left-Hand, a 72"W Credenza, a 72"W Hutch, a Box Box File, and a Pair of Trays. The Santa Cruz Lounge Series Sofa has buffalo split polyurethane coated leather on all seated surfaces. It has a seat that is 19"H.
Inspired by the Louis-Philippe design, Rue de Lyon expertly blends old world styling and modern functionality. The collection is crafted from maple solids, select hardwoods and American cherry veneers on select wood products finished in a rich chocolate patina. A nice durable piece of office furniture for every home or business need. 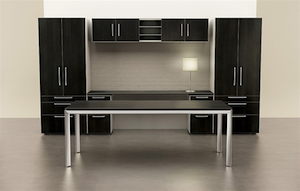 The Napoli Series Suite #35 consists of a 72"W Desk, a Center Drawer, a Bridge Left-Hand, a 72"W Credenza, a 72"W Hutch, a Box Box File, and a Pair of Trays. VQV Furniture Group... offers its certified factory relationships and design resources to serve all of your office furniture needs. We feature many furniture collections and desks for sale in our stores to meet every workspace requirement and budget. You can search our site, chat online, or call our office design specialists with questions about our office desks, office chairs, office storage cabinets, home office furniture, mail sorters, breakroom tables, or any of your office furniture needs you may have. As an added benefit, we offer FREE SHIPPING on most of our discount office furniture! The quality office furniture on sale in our stores will ship to your location very quickly. Many office desks, filing cabinets, and office chairs will ship within a couple of days of your order. No matter what your needs for office furniture are, our fully trained office designers are ready to assist you. Simply call, email, or chat online. Describe your specific office furniture needs and our staff will help you design your new office furniture layout in just a matter of days, not months. 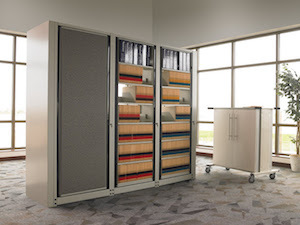 And remember - ALWAYS FREE SHIPPING on our standard office furniture collections. Our certified dealer relationships allow us to offer first quality furniture and seating products from many of the most respected manufacturers in the industry. Listed below are a few of the highlights. 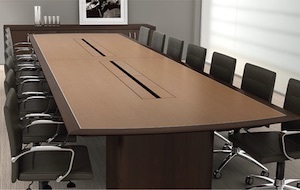 Mayline Office Furniture... is one of North America's most complete office furniture manufacturers. It provides a broad range of products including desks and workstations, seating, tables, high density storage and filing, mailroom furniture, veneer and laminate casegoods, technology furniture, drafting / architectural cabinets and tables, and bistro and cafeteria tables and chairs. The Mayline Group ranked #1 in Customer Service performance in 2013 by Office Furniture USA (OFUSA) dealer survey (ranked #1 out of 27 manufacturers)! In addition, Mayline was also recently recognized by INDEAL for having the "easiest product to install." This award is based on the results of a survey of their dealer network on several different criteria. DMI Office Furniture... is a contract manufacturer and marketer of premier quality desks, office storage cabinets, seating and conference tables. It believes that Design Changes Everything, a philosophy that sets DMI apart within the office furniture industry. DMI began operations in 1911 as the Huntingburg Furniture Company in Huntingburg, Indiana. Fom its early days DMI was very conscious of the important relationship between quality and consumer value. DMI was acquired in September 2003 by Flexsteel, a well respected, upholstered manufacturer in the residential, hospitality, commercial, healthcare and recreational vehicle industry. 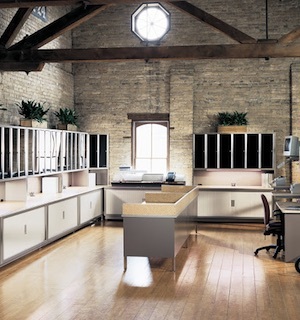 Paoli Office Furniture... established a noted heritage for craftsmanship that dates back to 1926. As a leading contract office furniture brand Paoli provides best in category desks, storage cabinets, seating, and conference products. Its products are American Made by great and hard working Indiana Hoosiers from the heartland of America. Many of its products are hand crafted by second and third generation craftsmen. They are passionate about how good they are, what they can do and how well they can service customers. The pride its members take in what they produce is why they can confidently say to you that when you choose Paoli, you made a great choice. As one of its leading online dealers, the VQV Furniture Group will make sure of that. Flash Furniture... provides quality seating and furniture products for a broad array of office, hospitality, school, and church environments. 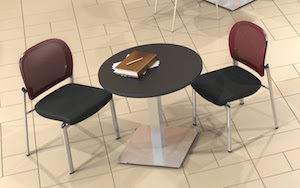 Its seating and table products provide durability, style, and functionality in many restaurant, cafe, office break room, school cafeteria, and church fellowship areas. Activity tables and chairs are available for a range of educational age groups. 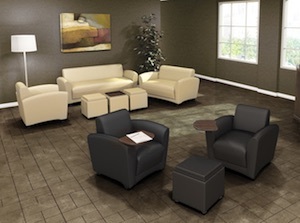 Seating products are available for the business lounge, reception, and lobby areas. 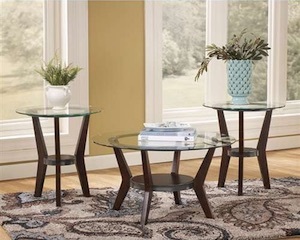 Signature Design by Ashley living room seating has recently been added to the Flash Furniture line of products. 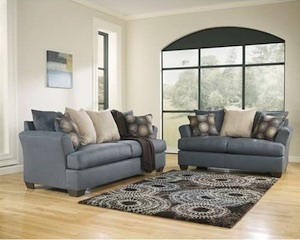 You can select from the college theme recliners, sectionals, sofas, and loveseats. These upholstered products will bring style to any living space and help you save money. HAT Contract... provides the Silicon Valley market with the best value in electric height adjustable tables and back it up with a great service program that includes reliable in-stock availability. The HI HAT base has an adjustability range (with a standard work surface) of 24" to 51". 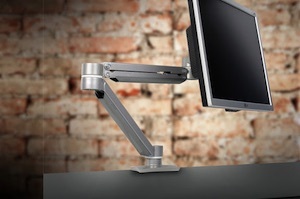 That range conforms to BIFMA regulations which are often specified by designers as an ergonomic requirement. The MID HAT adjusts from 26.5" to 46.5" (with a worksurface) which is plenty of range for most people. ESI Ergonomic Solutions... was established in 1988 and has its headquarters in Mesa, Arizona. They provide LCD monitor arms, keyboard trays, technology management solutions, lighting, and ergonomic height-adjustable tables. This woman-owned business has won awards for customer service, best products, best product innovation. If you are not already buying ESI products, we invite you to please give them a try. We are confident you will be happy you did! Highmark Seating Made Simple... is a national manufacturer of Commercial Seating Products for Corporate, Educational, Healthcare and GSA environments. Specializing in intuitive, clean, affordable and green products; Highmark produces a wide range of style and ergonomic functions. Intensa Medical Seating... is a manufacturer of medical exam beds, seating, laboratory seating, and medical equipment engineered specifically for the healthcare industry. 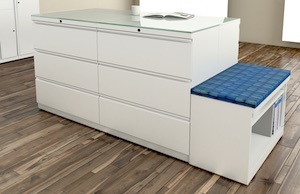 We offer a complete line of medical office furnishings, with a wide range of useful features and benefits designed to provide solutions for any scale budget requirements. At Intensa, our products are manufactured to the highest in quality standards, providing the end user with a true value product. OFM... is a family-owned furniture supplier that was started in 1995 with a focus on consumer satisfaction and fast delivery times. Its primary products are office furniture for business, government, schools, hospitals, and churches. The company sells just about everything needed to furnish an office out of its 124,000-square- foot office and warehouse in Holly Springs. Select from a broad array of office seating products, tables, desks, and reception area furniture. OFM contracts with manufacturers in Mexico, Taiwan and China to design its furniture and products that meet its exacting standards. Watson Furniture Group... designs and builds office furnishings for business, education, and institutional enterprises. 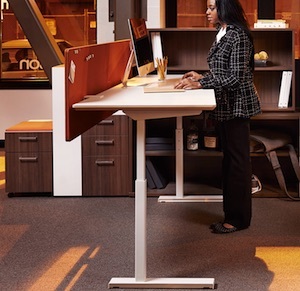 Products are designed to optimize space planning and function for cubicle infill applications, open plan neighborhoods, private offices, and communication hubs. For 50 years, Watson Furniture Group has demonstrated an unwavering commitment to quality manufacturing, outstanding customer service, and corporate responsibility toward employees, neighbors, and the environment. Regency Office Furniture... is about relationships and working with people you love and respect. Family members and hard-working Men and Women who become part of the unique, extended family that gives life to our company and help it grow and prosper. This particular dream begins back in 1940, when Scott and Norma Summerville opened their own office products business. Established in 1966, our company will celebrate 50 years of successful business in 2016. All of our products are built-to-order. This enables us to quickly and efficiently manufacture exactly the product you need, when you need it. ERG International... founded in 1981, is a privately owned family business that manufactures contract furniture. ERG has been known for quality and craftsmanship in the corporate, higher education, healthcare, government and hospitality markets. Our products have been designed and tested for these markets for many years. As one of the leading seating and table manufacturers, we offer an extensive product line as well as create custom furniture for your most demanding needs. The extensive versatility that is available from ERG International stems from the fact that we are truly a furniture manufacturer. Our plant in Oxnard California has the latest in furniture manufacturing equipment including computerized equipment and automatic conveyor systems. 100 patents in 40+ years. In short, where others see problems, Byrne sees opportunities. From great thinking to great solutions. From concept to production and everything in between. Byrne is one of the most trusted names in power and data technologies. ECA Electrical Components... was founded in April 1975. Through vision and leadership ECA expanded from manufacturing wiring harnesses to providing electrical solutions for panel system furniture. 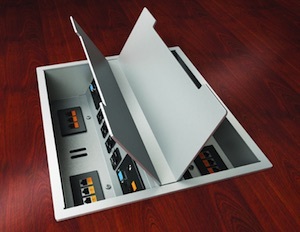 As the demand for power and data in offices changed over the years, ECA began offering new products to meet those needs. This new line of worksurface electric .products grew until now it encompasses hundreds of different style products for virtually any application in the home, school, hospitality, and office environments. ABCO Office Furniture... If you're a small to medium-sized business, or establishing a home office, ABCO can help you learn the ABC's of furniture. They have a focus on the educational market to provide learning furniture solutions. Choose from a wide variety of colors (think school spirit and corporate colors), finishes and fabrics to create your own look. 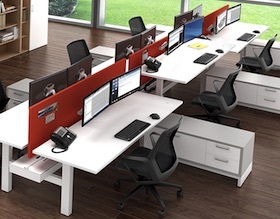 Choose different shapes and sizes of desks, tables, chairs and office panels. Not sure how much to order or how large your workstation or conference table should be its space-planning services can help. 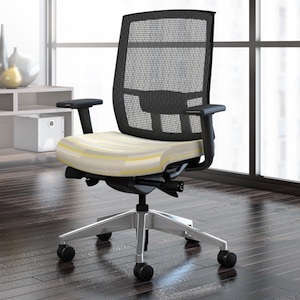 Office Star Products... began selling commercial office seating in the early 1980's. 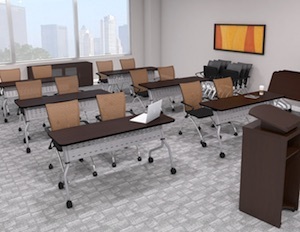 25+ years later we have expanded our product assortment to include commercial and residential office seating, casegoods, training tables, cubicles, hospitality and educational furniture as well as residential and accent furniture. Office Star currently operates out of a 200,000 sq.ft. warehouse in Ontario, CA, with an additional 450,000 sq.ft. warehouse in Fontana, CA. Regional distribution is offered from multiple warehouses throughout the United States and Canada including our newest 150,000 sq.ft. facility in Austell, GA.
Wholesale Interiors... offers wholesale furniture for the home and hospitality industry. 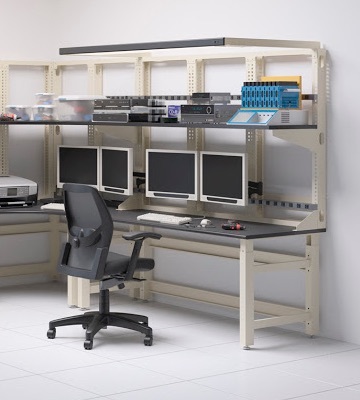 It furniture warehouse is centrally located near Chicago, Illinois. 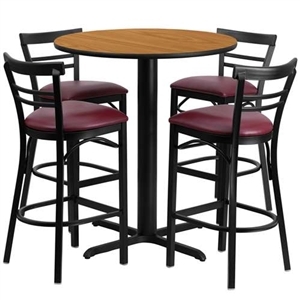 Select from a broad variety of contemporary and traditional restaurant wholesale furniture. With over 350 different designs, they guarantee a diverse collection that will certainly meet the specifications our customers. Their product line continues to expand, providing up-to-date wholesale furniture to a large number of customers nationwide. Wholesale Interiors was founded in 2002. It has grown to be one of the largest and fastest-growing wholesale furniture suppliers in the nation. 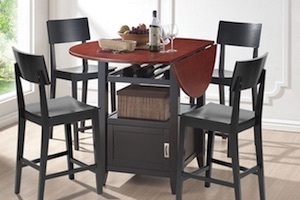 Not only are they able to deliver to furniture stores from coast-to-coast, but their products are available for prompt and efficient delivery throughout the Chicago area. 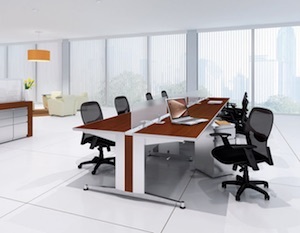 With our nationwide network of office furniture installers we can offer our White Glove Delivery and installation. That means, you don't have to deal with the hassle of unboxing, assembling, and arranging the office furniture you order. We can arrange all of that for you. Simply ask us about this White Glove service and we will quote you a price. Buying from the VQV Office Furniture Group is easy. We have thousands of satisfied customers who have purchased office furniture, including Fortune 500 companies, large and small businesses, federal, state and local government, churches, schools, hospitals, and non-profit organizations. Our office design specialists are here to help make the purchase process of discount office furniture as easy and simple as possible. You can buy with the confidence that the office furniture you have purchased has Verified Quality & Value. Our nationwide customer base continues to grow as we add new products and installation services around the country. If you live in or near one of the cities below we can help you with your office design and installation requirements. Give us a call and one of our office design specialist will be happy to help you save time and money as your furnish your office space.